The junior is on pace for records in the 50 freestyle and 100 backstroke, as well as her third consecutive state titles in both events. If Janelle Rudolph just does herself this weekend, she won’t be racing the field in either of her individual events at the Class 3A state girls swimming and diving championships at King County Aquatic Center. If Rudolph just does herself, the field will be in her rearview mirror. When Rudolph jumps into the pool on Friday for her preliminary races in the 50-yard freestyle and 100 backstroke, she does so with massive leads over the next best qualifier. 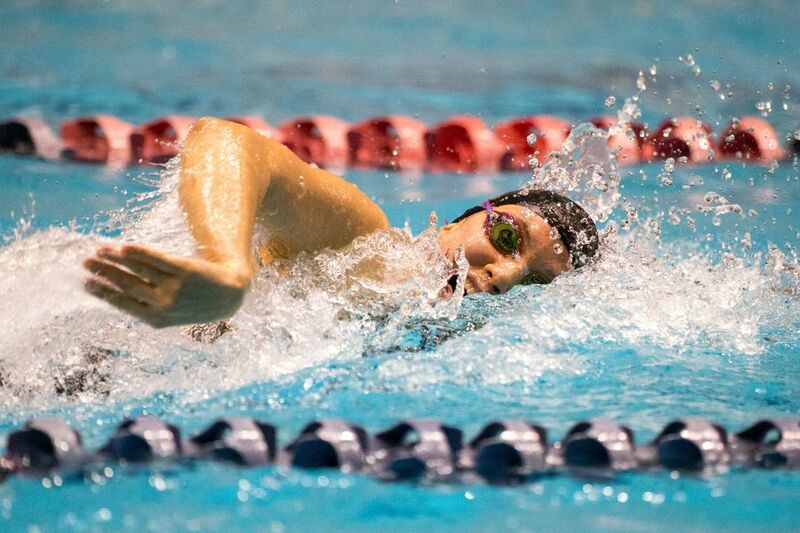 Rudolph won the 50 free at the SeaKing District meet in 22.87 seconds, which was not even her personal best (22.78). The second qualifier to state in the event, Ella Haskins of Bishop Blanchet, swam 23.96. In the 100 back, Rudolph leads Lakeside’s Isabel Chien by more than three seconds — 53.68 to 56.77. If Rudolph just does Rudolph, what the Bellevue High junior will be racing is history this weekend as she and her teammates chase a second consecutive state team title. 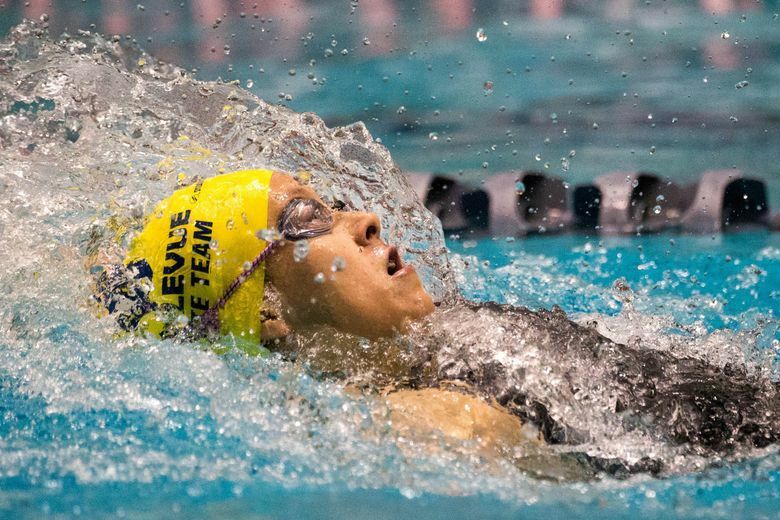 Bellevue comes into the state meet with qualifying swims that would give them 291 team points, enough to beat Lakeside’s second-place total of 265. She is already the two-time defending champion in both events. Two more titles during the afternoon finals Saturday will give her six for her career and put her in a position to chase the maximum of eight individual championships as a senior. Only four girls in Washington have accomplished that feat. Rudolph’s qualifying times are All-America Automatic times. If she doesn’t improve her 50 time over last week’s district performance but just repeats it, she’ll break the Class 3A state meet record that has stood for a decade — since Mount Rainier’s Leona Jennings set the standard of 22.92 on Nov. 15, 2008. A mere .03 improvement in the 100 back not only would break Jennings meet record of 53.66 from the same year, but also would break the overall state record. In addition to swimming, which Rudolph does year around with her ProSwimming club team in Bellevue, Rudolph volunteers along with a couple of friends every Sunday in the children’s daycare center at Bellevue Presbyterian Church. She’s played the piano for more than a decade. And she’s a painter, though she says that endeavor gets pushed to the back burner more often than not these days. Her outside interests help her in the pool, she says. “I’ve really learned how to manage my time well over the last couple of years,” Rudolph said. Schedule: Friday prelims, 1A/2A: 9:45 a.m.; 3A: 2 p.m.; 4A: 6:30 p.m. Saturday finals, 1A/2A: 9:15 a.m.; 3A: 2:10 p.m.; 4A: 7 p.m. Follow along: On Twitter, @WIAAWA, @aaronlommers, @seatimespreps. Top storylines: Perennial state power, defending champion and state favorite Newport seeks a fourth 4A title since 2012. … How will the final rounds between Skyline’s Sarah DiMeco and Newport’s Yulia Groysman end in their four-year rivalry for the 200 and 500 freestyle? Groysman has the top qualifying time in the 200 free and DiMeco in the 500, while the other is second in the other event. … Three KingCo 3A teams enter the state meet with at least one top-16 qualifying time in each of the 12 events: defending champion Bellevue, Mercer Island and Lake Washington. … Lakeside and Bellevue look poised for yet another team-title fight, but fellow east-side squads Mercer Island and Lake Washington could have something to say about it. … The Liberty Patriots try to continue their run of 2A titles that sits at four in a row, but based on qualifiers and qualifying times the favorite this week is North Kitsap, 291-233. Five to watch: Sarah DiMeco, Skyline. The two-time defending 4A champion in 500 freestyle was the district champion last weekend. Won 200 free as a sophomore before being DQ’d a year ago. … Gabrielle Dang, North Creek. The 4A champion in the 100 free in 2017 won 3A titles in 50 and 100 freestyles for Bellevue as a freshman. Won the 50 free at districts in AAC time of 23.35 and the 100 fly in an AAA time of 53.72. … Yulia Groysman, Newport. Defending 4A champion in 200 free won the district title in AAC time of 1:50.32. … Nathalie Valdman, Lakeside. Top 3A qualifier in the 200 and 500 freestyles, the second in an AAC time of 4:56.75, was second in the 500 and fourth in the 200 at state in 2017. … Eleanor Beers, North Kitsap. Defending 2A champ in the 50 and 100 freestyles has the top qualifying times in both events again. Last: The Kangaroos of Lake Washington could find themselves in the middle of a crowded race for the Class 3A title on Saturday night. Based on qualifying times, the Kangaroos would score 229 points, which would place them third behind Bellevue and Lakeside, the teams that have won the last four 3A championships. Lake Washington’s last title came in 2012, when the school was at Class 2A.